Gertrude R. (Cronan) Tolland, 96, of Franklin and formerly of Vero Beach, FL and Framingham passed away on Saturday, August 18, 2018 at St. Patrick’s Manor in Framingham after a brief illness. Born in Boston, she was the daughter of the late Edward V. & Gertrude V. (Pfeiffer) Cronan, and the beloved wife of the late Joseph G. Tolland, Jr. Raised in Hyde Park she was a proud graduate of Girl’s Latin School and earned a BS in Biology from Emmanuel College, a distinct achievement for the times. In 1943 she married the love of her life Joe and settled in Natick. In 1953 Gertrude and Joe moved to Framingham to raise their seven children. 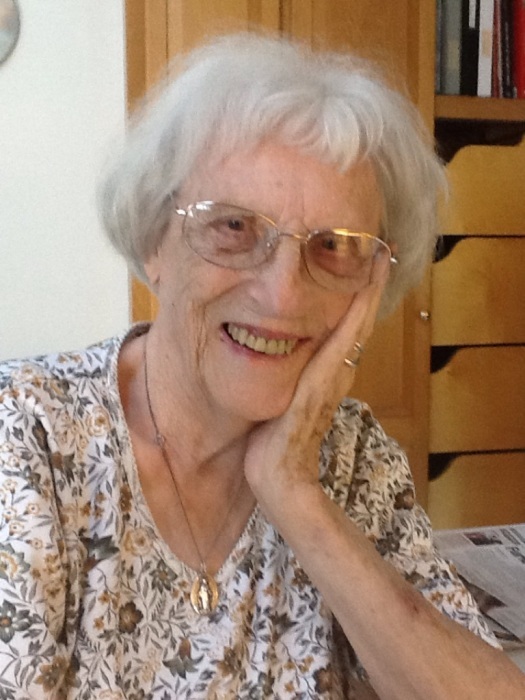 A strong supporter of her community and church, Gertrude taught pre-school and Title 1 in Framingham for many years. She was a member of the St. George’s Sodality and the St. George’s Bridge Club. An avid reader, relishing a good mystery, Gertrude loved animals & nature and enjoyed traveling, especially with her friends the “Cruisewells”. She delighted in the company of her family and many friends. Blessed with a large family, Gertrude is survived by her children, Jean M. Tolland of Franklin, Joseph G. Tolland III, of Framingham, Edward H. Royce-Tolland & his wife Helene of Framingham, Alan M. Tolland of Franklin, Robert C. Tolland & his wife Deborah of Sterling, Andrew J. Tolland & his wife Patricia of Franklin, and Margaret J. Chanquet of Salem, NH, 13 grandchildren, 15 great grandchildren, her Brother-In-Law Frederick Tolland of Natick and several nieces and nephews. Besides her husband Joe, Gertrude was predeceased by her siblings, Edward V. Cronan Jr. and Helena Miley. Family and friends will honor and remember Gertrude’s life by gathering for visiting hours in the McCarthy, McKinney & Lawler Funeral Home, 11 Lincoln St., Framingham on Monday, August 27th from 6 – 8 P.M. Her Funeral Mass will be celebrated on Tuesday morning in St. George Church, 74 School Street, Saxonville, at 10 o’clock. Interment will be private at a later date. In lieu of flowers, remembrances may be made in Gertrude’s name to; Guiding Eyes for the Blind, Yorktown Heights, NY (www.guidingeyes.org / 800-942-0149) or the Town of Franklin Senior Center (www.franklinma.gov/fsc / 508-520-4945).